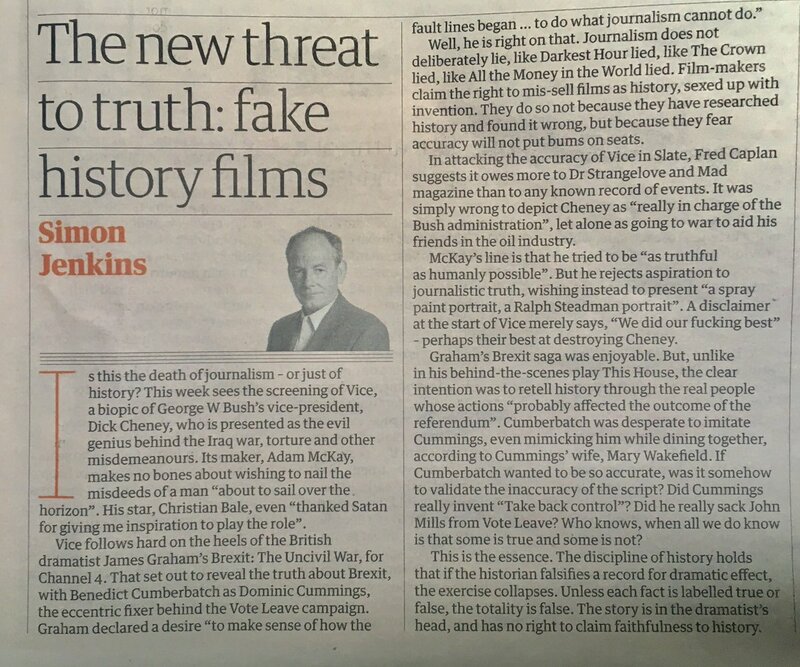 Fake history films – ‘the new threat to truth’ as this recent article in the Guardian postulated. Wow! The truth is all history films are fake. There’s just no way the past can be replicated in any way or form. The closest one would see to the truth might be news reels and documentaries filmed in the earliest days of the 20th Century. Even when one splices these news reels together it only gives a one sided view of things. Even some of these documentaries were fakes as we will see later. Going back further in time than this that happens to be even more of a problem because, well, they didnt have cameras or movies in those days! There is no absolute truth to the past, we can make what we want of it therefore our histories are mostly constructed. Everything is a hatchet job. One could say World War Two was basically UK, France, USA, Russia against Germany, Japan, and the Germans and Japanese lost out – but such a compressed assertion of WWII is nothing more than a mere passing of the truth. Even the most historically accurate moves are anything but. In Lawrence of Arabia the Turkish Bey and Sherif Ali (and others) are fictionalised characters meant to give more interest. No-one can deny that Sherif Ali’s entrance as he looms out of the misty haze is extremely dramatic but the guy doesn’t even exist! Our Thomas with Sherif Ali – a guy who did not exist in Lawrence’s day. As Simon Jenkins notes, historians have peddled Richard III in an unfavourable light for centuries. In Laurence Olivier’s Richard III (1955) we can at least accept its Shakespearean interpretation of the maligned King’s life is somewhat acceptable, despite being allegedly ‘far too camp and stagey’ and ‘an exaggeration of a distortion that gets us no closer to the truth.’ Guardian. When it comes to the final scenes in Olivier’s film, one’s certain to be outraged. Its battle scenes show fake movies at their very worst. If you’ve been to Sutton Cheney or Ambion Hill wher the famous battle took place, you’ll know its gently rolling and green English hills – yet the film depicts the famous battlefield with mountains clearly visible! The critics of the time slated Olivier’s film for this huge gross historical inaccuracy. Olivier’s Richard III at the start of the historic Battle of Bosworth – but is that really Leicestershire? At least the later Richard III film with Ian McKellen in the lead, its made out to be nothing more than historical fantasy. Thus one knows they are not being duped in any way. The film for starts is featured as being in a quasi World War Two setting and its final battle scenes happen to take place in what are the ruins of Battersea Power station transposed to ‘Kent.’ Perhaps it somehow took inspiration from Olivier’s production which filmed its battle scenes in Spain. WWII bomber coming after Richard III at the ‘Battle of Battersea’ in the McKellen production of 1995. The earliest war movies were meant to be actual documentaries but their crews did not want to be filming real wars because it was considerably difficult, there was the risk of injury or worse, and also because it wasn’t quite so interesting as others had found. In fact those who attempted to record wars found them somewhat lacking in excitement and the first documentaries were a bit of a let down. As this Smithsonian article tells us, the early documentary film makers found that by way of dictating and controlling the content, these fake war films became far more interesting documentaries and movie goers thought they were the real truth! Creativity is the problem! How much do you hack out, how much do you edit to make it look interesting. And will it be a good representation of what is the truth when you have finished it? Exactly! But in turn the available facts are themselves manipulated. F for Fake. Wells then presents another story in the film which he elaborates on before admitting to the audience… ‘I have been lying for seventeen minutes.’ All these different narratives, whether they are true or not, are about convincing the viewer its not easy to know the truth. This is something that is still done to this day. All the movies we get to see are attempts to convince us of something – no matter how true or how fake it may be. Yikes! That’s gotta be George Galloway! That’s it exactly. But Wells’ attempt didnt sit well with the movie goer and ‘F for Fake’ practically flopped. People want to be entertained and if its a very inaccurate film but still greatly entertaining, then this is all that matters. F for Fake tried to be too many things and it just didnt work. When someone puts a series of smartphone clips on You Tube, Twitter, Facebook showing a particular event, others come up with their own clips showing alternative perspectives of the events. Each side does battle because one wants to own the truth and show the other as a liar. The problem is not that there’s one correct truth, its that both sides want a certain truth to be shown and again this constructs a rather incorrect view of reality. 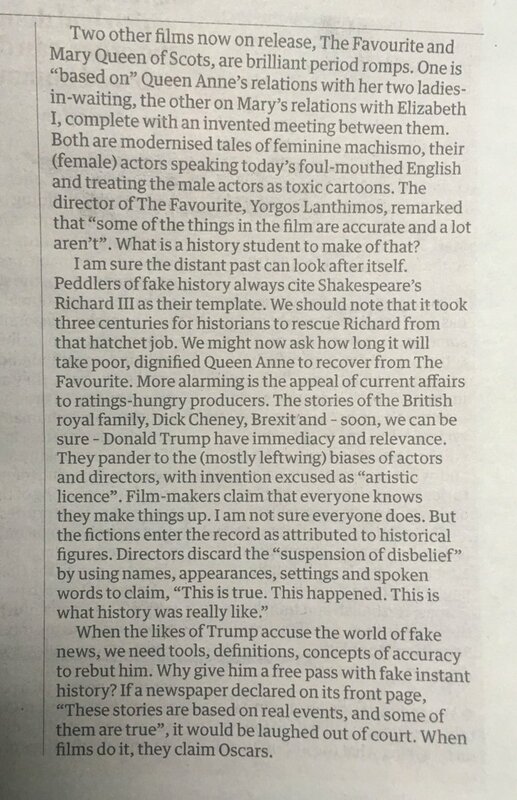 One of the replies in today’s Guardian (29/01/2019) to Simon Jenkins’ article on fake films. The above reply is spot on about several things – however I wouldn’t go as far to claim journalism isn’t fake in terms of making movies. A lot of journalism is based on a perceived truth and there’s just no way there can be an absolute truth. Journalists do make films and they want to capture peoples’ attention so there is without doubt some degree of manipulation, especially those examples cited by the Smithsonian. In our attempts to make history more accurate we still end up with a less than truthful representation and its still difficult to even tell where the truth ends and the lies start. Its up to us to decide what is fake and what isn’t, and both are pretty well down to how each of us interprets things in our own ways. Some say as long as a movie engages people in a particular subject and its viewers are able to question a film’s validity, it becomes an ongoing work of deconstructing the film in order to find these truths – and if there aren’t any, to acknowledge it a fake. Previous Post: Victoria Line 50th – a cake of a time!